Most organizations and departments have a mandate to continuously improve business operations. A conventional change agenda involves better tools and technology, better behaviors, and better processes, all focused on generating better efficiencies and improved productivity. How do you distinguish between tactical and strategic business transformation initiatives? 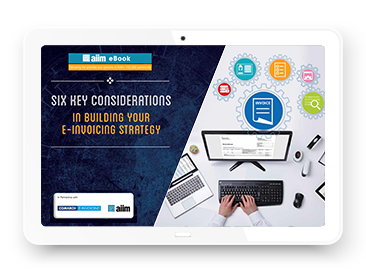 What are the main considerations in creating your own e-Invoicing strategy? Download the FREE e-Book now, and learn from Comarch and AIIM partnership project. Your consent is being requested under the regulations governing the distribution of unsolicited commercial communications and direct marketing by email to allow our representatives to contact you by an email message. In this case your personal data will be processed by companies of the Comarch Group based on their legitimate interests. Learn more about the processing of personal data by the Comarch Group companies. Based on this consent your personal data will be processed by companies of the Comarch Group to send you a newsletter. You can withdraw your consent at any time, but remember that this will not affect the lawfulness of data processing based on the consent before its withdrawal. Your consent is being requested primarily under the personal data protection regulations. By giving this consent, you agree to receive – via the email– unsolicited commercial and direct marketing communications contained in our newsletter. The processing of your data by companies of the Comarch Group and your rights as the data subject. Comarch e-Invoicing guarantees partners on-boarding with data validation, invoice format mapping and a distribution channel tailored to your company and your partners requirements. As a result, e-invoicing will speed up the decision process due to reliable data, optimise cash flow and improve cooperation with your partners.